This theme name is Kero Keroppi Theme which owned by someone. This theme is not mine, I just want to share only this to our Co-Oppo user who really loves themes. Please give credit to the real owner of this themes. Don’t try to other phone to prevent error. How to download Oppo Kero Keroppi Theme? This is for default browser: Go to Setting ➜ App Management ➜ All ➜ Browser ➜ Permissions ➜ Enable Storage. This is for Chrome: Go to Setting ➜ App Management ➜ All ➜ Chrome ➜ Permissions ➜ Enable Storage. How to Apply Kero Keroppi Theme? Locate the theme you downloaded, the location of the downloaded file is at Files ➜ All Files ➜ Download. Tap the theme and click the apply button to apply the theme. 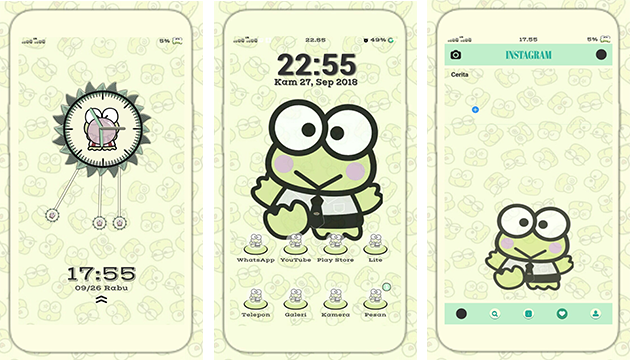 Thank you for browsing this Oppo Kero Keroppi Theme, if you think this article is helpful do not hesitate to share this article to our Co-Oppo user. Thank you so much. Sharing is giving!